Bertrand, Darboux, and Glaisher have compared Cayley to Euler, alike for his range, his analytical power, and, not least, for his prolific production of new views and fertile theories. There is hardly a subject in the whole of pure mathematics at which he has not worked. In Proceedings of London Royal Society (1895), 58, 21. From Pythagoras (ca. 550 BC) to Boethius (ca AD 480-524), when pure mathematics consisted of arithmetic and geometry while applied mathematics consisted of music and astronomy, mathematics could be characterized as the deductive study of “such abstractions as quantities and their consequences, namely figures and so forth” (Aquinas ca. 1260). But since the emergence of abstract algebra it has become increasingly difficult to formulate a definition to cover the whole of the rich, complex and expanding domain of mathematics. In 100 Years of Mathematics: a Personal Viewpoint (1981), 2. Gödel proved that the world of pure mathematics is inexhaustible; no finite set of axioms and rules of inference can ever encompass the whole of mathematics; given any finite set of axioms, we can find meaningful mathematical questions which the axioms leave unanswered. I hope that an analogous Situation exists in the physical world. If my view of the future is correct, it means that the world of physics and astronomy is also inexhaustible; no matter how far we go into the future, there will always be new things happening, new information coming in, new worlds to explore, a constantly expanding domain of life, consciousness, and memory. From Lecture 1, 'Philosophy', in a series of four James Arthur Lectures, 'Lectures on Time and its Mysteries' at New York University (Autumn 1978). Printed in 'Time Without End: Physics and Biology in an Open Universe', Reviews of Modern Physics (Jul 1979), 51, 449. Here's to pure mathematics—may it never be of any use to anybody. A toast, variously attributed as used of old at Cambridge University, or as used by G.N. Hardy (according to Arthur C. Clarke in 'The Joy of Maths', Greetings, Carbon-Based Bipeds! : Collected Essays, 1934-1998 (2001), 460). From Address (22 Apr 1857) for Inauguration of Washington University, St. Louis, Missouri, collected in 'Academical Education', Orations and Speeches on Various Occasions (1870), Vol. 3, 514. 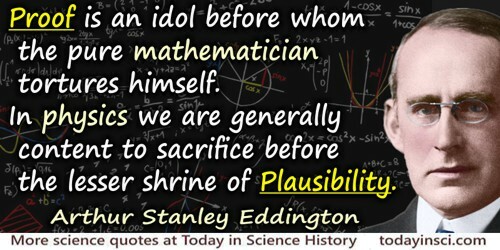 This is seen misattributed to Eric Temple Bell, who only quoted it, attributing it to Everett, in for example, Mathematics: Queen and Servant of Sciences (1938), 20. In working out physical problems there should be, in the first place, no pretence of rigorous formalism. The physics will guide the physicist along somehow to useful and important results, by the constant union of physical and geometrical or analytical ideas. The practice of eliminating the physics by reducing a problem to a purely mathematical exercise should be avoided as much as possible. The physics should be carried on right through, to give life and reality to the problem, and to obtain the great assistance which the physics gives to the mathematics. In Electromagnetic Theory (1892), Vol. 2, 5. 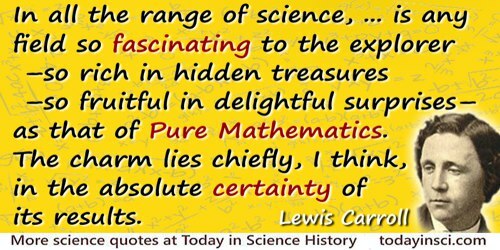 It may well be doubted whether, in all the range of science, there is any field so fascinating to the explorer—so rich in hidden treasures—so fruitful in delightful surprises—as that of Pure Mathematics. The charm lies chiefly, I think, in the absolute certainty of its results; for that is what, beyond all mental treasures, the human intellect craves for. Let us only be sure of something! More light, more light! Written without pseudonym as Charles L. Dodgson. Opening remarks in Introduction to A New Theory of Parallels (1888, 1890), xv. Mathematics is distinguished from all other sciences except only ethics, in standing in no need of ethics. Every other science, even logic—logic, especially—is in its early stages in danger of evaporating into airy nothingness, degenerating, as the Germans say, into an anachrioid [?] film, spun from the stuff that dreams are made of. There is no such danger for pure mathematics; for that is precisely what mathematics ought to be. In Charles S. Peirce, ‎Charles Hartshorne (ed. ), ‎Paul Weiss (ed. ), Collected Papers of Charles Sanders Peirce (1931), Vol. 4, 200. Once a mathematical result is proven to the satisfaction of the discipline, it doesn’t need to be re-evaluated in the light of new evidence or refuted, unless it contains a mistake. If it was true for Archimedes, then it is true today. In 'The Unplanned Impact of Mathematics', Nature (14 Jul 2011), 475, No. 7355, 166. Pure mathematics proves itself a royal science both through its content and form, which contains within itself the cause of its being and its methods of proof. For in complete independence mathematics creates for itself the object of which it treats, its magnitudes and laws, its formulas and symbols. In Die Mathematik die Fackelträgerin einer neuen Zeit (1889), 94. As translated in Robert Édouard Moritz, Memorabilia Mathematica; Or, The Philomath’s Quotation-book (1914), 11. Pure mathematics; may it never be of any use to anyone. 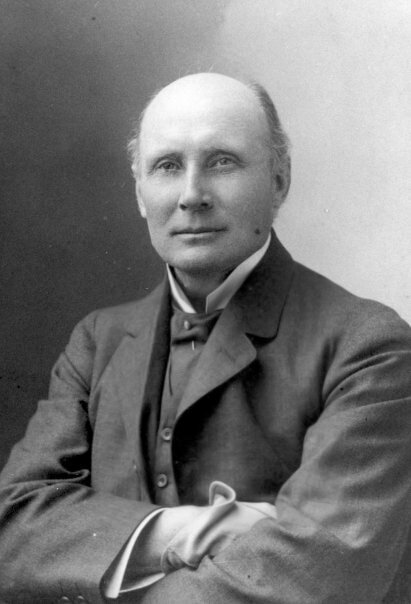 A banquet toast, quoted as “I believe that it was at a banquet of the Red Lions that he proposed the toast…”, in Alexander Macfarlane, 'Henry John Stephen Smith', Lectures on Ten British Mathematicians of the Nineteenth Century (1916), 100. 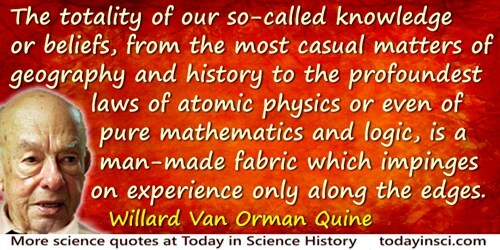 The pure mathematician starts with an unknown and ends with an unknown. Martin H. Fischer, Howard Fabing (ed.) and Ray Marr (ed. ), Fischerisms (1944), 40. 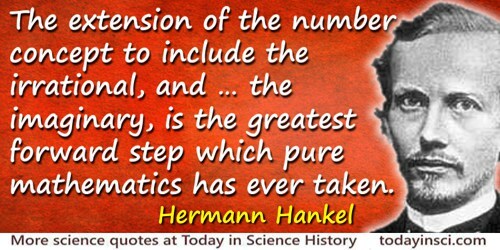 The pure mathematician, like the musician, is a free creator of his world of ordered beauty. In A History of Western Philosophy (1945), 33. 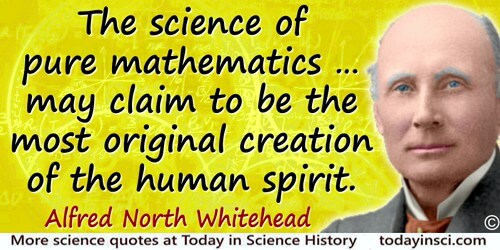 The science of pure mathematics … may claim to be the most original creation of the human spirit. In Science and the Modern World: Lowell Lectures, 1925 (1925), 29. This trend [emphasizing applied mathematics over pure mathematics] will make the queen of the sciences into the quean of the sciences. [Experimental Physicist] Phys. I know that it is often a help to represent pressure and volume as height and width on paper; and so geometry may have applications to the theory of gases. But is it not going rather far to say that geometry can deal directly with these things and is not necessarily concerned with lengths in space? In Space, Time and Gravitation: An Outline of the General Relativity Theory (1920, 1921), 14. In A Mathematician’s Apology (1940, reprint with Foreward by C.P. Snow 1992), 134. 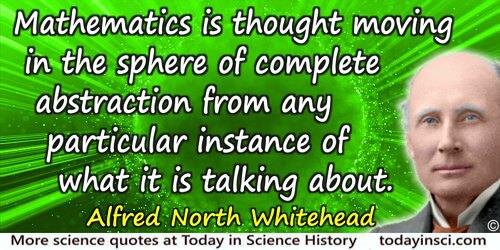 …nature seems very conversant with the rules of pure mathematics, as our own mathematicians have formulated them in their studies, out of their own inner consciousness and without drawing to any appreciable extent on their experience of the outer world. In The Mysterious Universe (1930), 113.